« Do everything wrong, get good Photo! 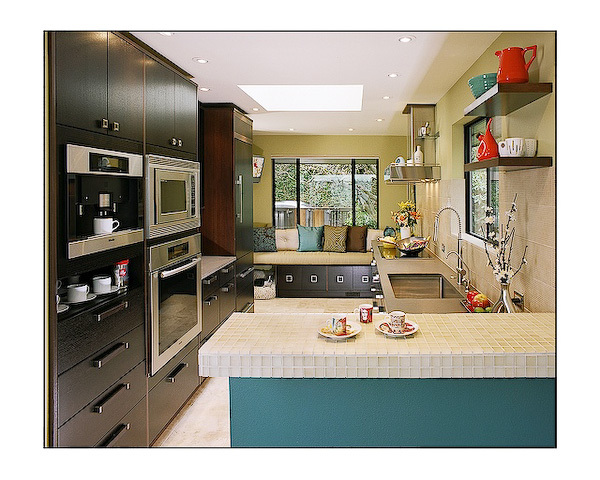 Savvy Cabinets hires me to photograph their work for Kitchen and Bath design contests. This little photo required a bunch of gymnastics (for the camera and lights). Lighting small areas is tough. There is no place for lights. So we are back to mutiple exposures with a light in and with a light out… then combining them. To finish the image I tweaked the vertical perspective (mostly with the camera)… but not enough… so I tweaked the horizontal perspective (mostly with Photoshop)…. Then, the picture looked like a real carpenter with a square and a level built the kitchen. This is important. Architects and designers hate distorted wide angle lens shots….. This image was made with several lights you can’t see, a 40mm lens, and a 21/4 square camera with Kodak film. This entry was posted on November 8, 2008 at 12:35 PM	and is filed under Architectural Photography. Tagged: Architectural Photography. You can follow any responses to this entry through the RSS 2.0 feed. You can leave a response, or trackback from your own site. Looks great Mike! I’m sure your client will be thrilled. Reading your behind the scenes description of how the image was done really proves that achieving photos like this requires much more than having a camera and pushing a button. What was funny (to me anyway) is that (since I know how to do this) the client says “…oh, are you done already…” when I moved the equipment on to a different setup for different view. Their previous photographer had to experiment for 2 hours to get stuff in order. Once I showed the Polaroid and she approved it it was 1/125th of a second times 3 and I was done (with the photography part of it). Then there’s the computer part of it… which wasn’t too bad because there were no inherent problems in the photo (like nasty reflections in that window back there). On the other hand… see the post called “It’s the curve, stupid!” for a different set of problems.